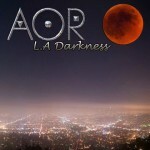 Share the post "Album review: AOR – L.A. Darkness"
Frédéric Slama is back with the latest installment of the AOR series, number fifteen to be precise. Joining him are an impressive list of singers including Jeff Scott Soto and Steve Overland, plus Tommy Denander helps out on the instrumental side of things. You normally know what to expect on an AOR album, usually lots of laid back AOR with a distinct West Coast/Toto feel. However on this album this is much more rock orientated, albeit melodic rock – nothing metal, fear not! The songs are like the press release states ‘edgier’, more like the rockier side of Foreigner, Toto et al. Some impressive vocal performances like Jesse Damon (Silent Rage) on ‘Blueprint For Love’ and Kevin Chalfant ‘One Foot In Heaven’, which sounds uncannily like one of his previous bands The Storm. Philip Bardowell pops up on the AOR-tastic ‘Desire Turning Into Dust’, surely time for another Places Of Power or solo album from him? FM’s Steve Overland never disappoints and has two songs on here, the melodic bliss of ‘The Locked Soul’ and the bizarrely titled ‘Heart In Pawn’ – nice mix of keys and guitar on this one. ‘Seven Storms’ sees a guest appearance from Prism’s Henry Small, who has a crystal clear vocal and the song has a 70′s feel. Those missing the more laid back side of AOR will enjoy the instrumental ‘Burning Rainbows’ which recalls Toto circa their ‘Fahrenheit’ album. The US version adds two bonus songs including one featuring the king of backing vocals on melodic rock albums (check your album credits on ones from Whitesnake, Magnum, Richard Marx among others), Tommy Funderburk. This entry was posted in ALBUM REVIEWS, ALBUM REVIEWS (Mobile), All Posts and tagged album, AOR, Frederic Slama, Jeff Scott Soto, Kevin Chalfant, LA Darkness, melodic, Philip Bardowell, review, rock, Steve Overland, Tommy Denander. Bookmark the permalink.